You are here: Home / Lifestyle / Eddie the Eagle Movie – Dream Big! Disclosure: This post was sponsored by Eddie The Eagle movie through their partnership with POPSUGAR. While I was compensated by POPSUGAR to write a post about Eddie The Eagle all opinions are my own. I just watched the Eddie The Eagle movie trailer with my son and he said, “I want to see it.” My sentiments exactly! I can’t wait to see it (and not just because Hugh Jackman is hot). 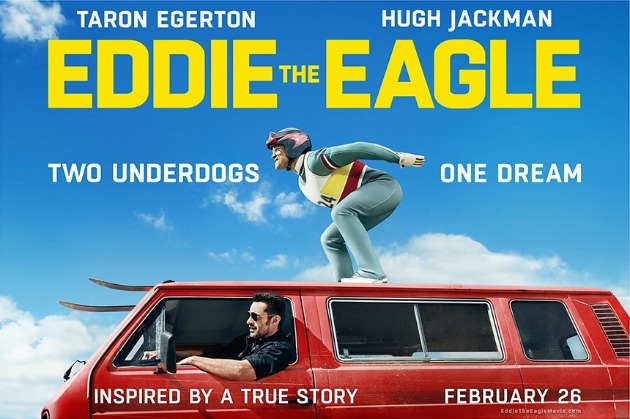 I love the positive message of the Eddie the Eagle movie which is based on a true story. I think this is the type of movie that recharges the dreamer in us all. Sometimes life beats us down and Eddie the Eagle, a ski jumper, totally gets that but he keeps dreaming and he dreams big! Eddie the Eagle is about two underdogs rising above based on sheer will power, drive, and sacrifice. So first a bit about the movie itself and then I will share with you how it speaks to me with its inspirational message. 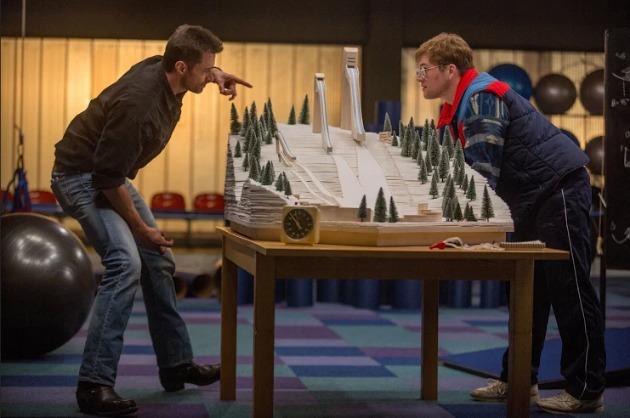 British ski jumper Eddie Edwards (Taron Egerton) is a hopeless athlete whose own dad tells him, “Eddie, you are not an athlete.” After some initial resistance, he finds a mentor in the rebellious Bronson Peary (Hugh Jackman) and trains for the 1988 Winter Olympics in Calgary, Alberta. With Peary coming to believe in him, his potential soars and he becomes Eddie “The Eagle”. The Eddie the Eagle movie is scheduled to be released on February 26, 2016, by 20th Century Fox. An Inspirational Movie – Dream Big! The Eddie The Eagle movie is an inspirational movie to me because it shows you how much a person can accomplish with a big dream and someone to support them in their dreams. My mother and grandmother always believed in me and that kind of support is so helpful not only in building confidence but also in pursing one’s dreams. But honestly, you can dream all you want and until you find a way to make it happen, it won’t happen. 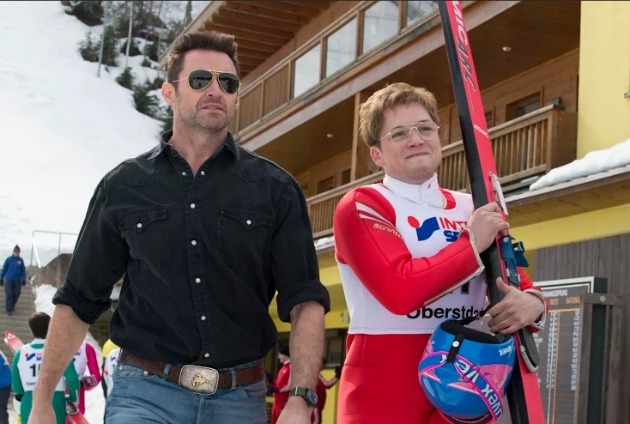 That is where Hugh Jackman’s character comes in with the power of a mentor that helps Eddie “The Eagle” accomplish those dreams through hard work. I have to tell you about my son. He is a very enthusiastic athlete. He loves football and basketball. He plays both and even though I am not athletically inclined or interested in sports, he is head over heels in love. He wants to be in the NFL when he grows up! Dream big I say but when he mentions that I change to other subjects. I remind myself of Eddie “The Eagle”‘s dad when he says, “You are not an athlete.” Though I would never say that to my son, I can see that he is below average in skills. I wish that I could be his motivational coach like Hugh Jackman’s character is and provide him with the practice and skills to reach his goals. But alas, I just don’t have the skills or the drive. Luckily my son’s coaches do a great job. They tell me that Leo tries hard and that he is improving and I appreciate them so much for that. For helping him and for helping me to be a believer. Yay coaches! Yay people who can draw out the best in people! Because I have to tell you that if anyone loves the game, my son does. He is always there with a smile and ready to play. I have to say, “Thank you,” to coaches everywhere for seeing the potential in people and for helping them develop their skills and bringing out the best in each player. Did Eddie “The Eagle” crash? Yes, he did. Many times, but he kept jumping and he kept believing. That is one of the important lessons of the Olympics. We all fall down but we have to get back up. My grandmother always told me, “If at first you don’t succeed, try, try, try again.” That may not have been a dream big quote that inspired me to dream bigger, but it was a quote that taught me to never give up. I hope you enjoy the positive message of the Eddie The Eagle Movie. Who’s your biggest supporter in life? Did this story trigger any personal memories you’d like to share? This looks like a fun movie to see. It reminds me of Cool Runnings. With our kids, we encourage them to try new things and promote that they give it their best shot. Somethings they learn it’s not for them, other times they soar.